In Texas, there are certain wedding customs that brides and grooms abide by every year. From reception fare to the wedding cakes enjoyed by guests, there are certain traditions that Texans hold in their hearts and that have endured for centuries. Those who have weddings in Dallas value the experience as a time for the gathering of family and friends. There are casual elements to weddings held there, but most weddings tend to feature a formal religious element of some sort. Perhaps one of the greatest examples of a traditional wedding being held in Dallas was that of Jenna Bush and Henry Hager, which featured a gathering of family and friends, a reception with barbecue chicken, and the placement of a permanent limestone cross at the altar. In Dallas weddings, the bride will typically wear a subdued gown at the wedding. At her wedding, Jenna Bush donned a simple, floral gown. There were no taffeta or fancy silk garments to be seen in this wedding. This is in line with the fashion sense of Dallas weddings, in which the bride will wear an organic or floral gown to blend with the natural beauty of the South. Instead of formal black suits, men at Dallas weddings will typically just wear casual or linen suits. At receptions in Dallas, it is customary to feature local and casual foods. A bride and groom may order barbecue chicken from their favorite local restaurant. Steak fries, steaks, and baked potatoes may also be found in plentiful quantities at these receptions. There may be other popular southern foods such as rice, baked beans, and green bean casseroles featured at weddings in Dallas. The bride and groom typically have their own wedding cake at a Texas wedding. It is common for a bride to have an elegant wedding cake that guests can enjoy. The groom will typically choose a wedding cake that embraces his educational background or other hobbies. If a groom attended the University of Texas or Texas A & M, then he may choose a wedding cake that features the logos of these schools. A groom who has an interest in rodeos or hunting may also choose a cake that has one of these themes too. It is common for a bride and groom to be married in the outdoors in Dallas. The beautiful summer weather of Texas typically makes for a pleasant atmosphere. A bride and groom may also venture out to the Alamo to have their photos taken the day before or after a wedding ceremony. There is a unique custom for brides in Texas to wear white cowboy boots with their gowns. This is a rather charming wedding tradition, and the bride will typically wear her boots throughout the church ceremony and in the reception following the church service. A groom will also typically don some cowboy apparel during a wedding. He may be seen wearing brown leather cowboy boots. Some grooms choose to take their apparel one step further and will wear suspenders with their suits at the reception ceremony. Overall, weddings in Dallas tend to be a wonderful time for families and friends to gather and spend time with one another. They also tend to be very fun events in which individuals can enjoy great local food and religious traditions. This piece was composed by Ricky Butler, a freelance writer based in El Paso, Texas. Ricky frequently writes on Texas wedding traditions, marriage and relationships, wedding themes, wedding attire and other associated topics; curious readers looking to learn more about weddings in Texas should view bridal shops in dallas tx. 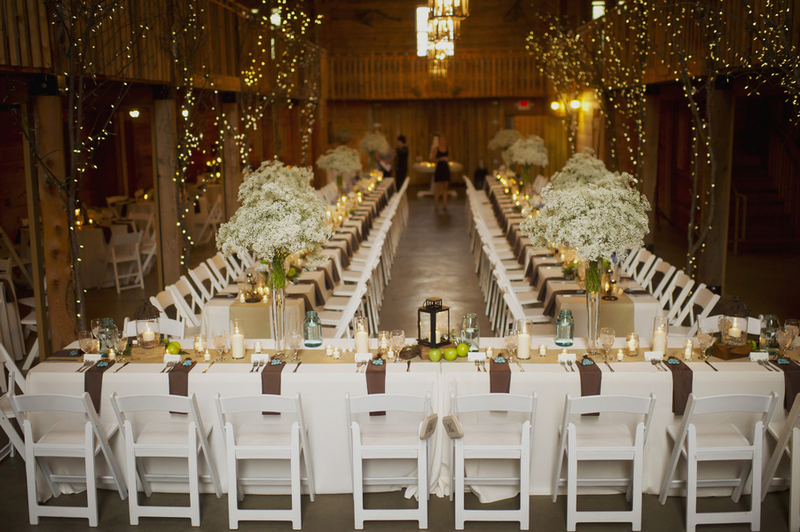 Bentwood Chairs Reception Table Featured on Real Weddings. This is a great photo idea: the bride in a tractor wheel. Arrange chair around the alter, where every guest has a perfect view of the “I do”.